I'd love to see you at Seattle VegFest this weekend! It is a great event, very inexpensive, with loads of free workshops and speakers! It takes place at 10am - 6pm at the Seattle Center's Exhibition Hall. 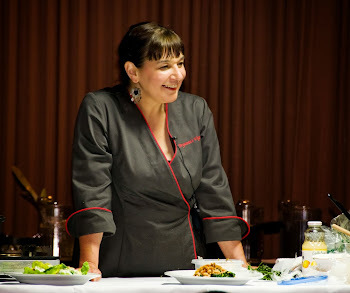 I will be demonstrating easy Italian recipes on Saturday, March 29th at 10:40 AM, and Desserts on Sunday, March 30th at 12:15 PM, in the Blue Room. 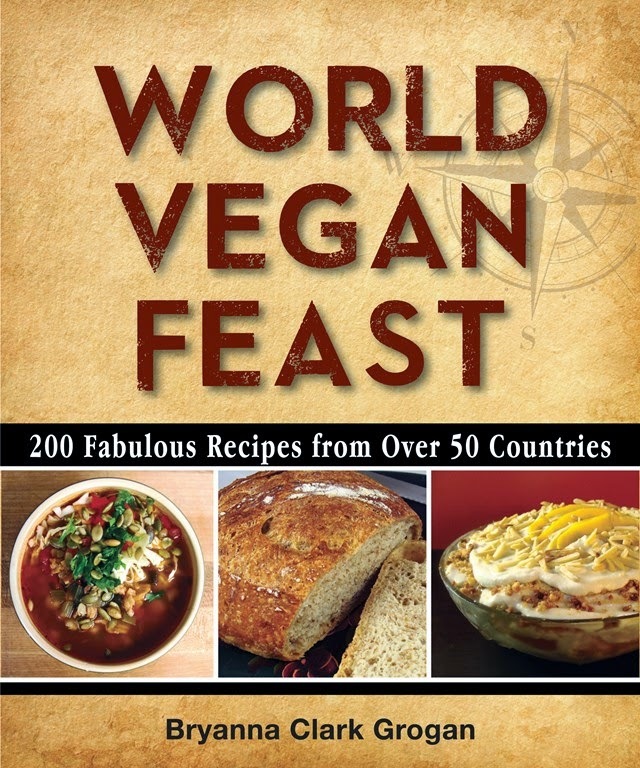 Directly after my demos (11:30am – 12:00pm on Saturday, and 1:10pm – 1:40pm on Sunday), I will be signing books at the VegFest Bookstore, which is a good time to chat with me. Hope to meet you there! MORE INFO ABOUT THE EVENT HERE. I'll be back home on Monday! Before I head off to pack, though, I'd like to quickly mention some new VEGAN "Better Than Bouillon" broth bases, or pastes, from Superior Touch. At least, they were new to me! 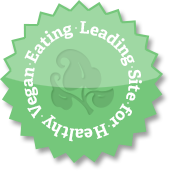 I bought the "No Beef Vegan base" and the "No Chicken Vegan base" at my local natural foods market, Edible Island, in Courtenay, BC. (Unfortunately, their "Mushroom Base" contains dairy products!) They have a "Vegetable base", too, and it comes in an organic variety. I did the "taste test"-- made a cup of each kind (it only takes a teaspoon of the base in a cup of boiling water) and DH and I each drank half of each kind. Delicious! I especially like the "No Chicken"--rich and satisfying (and lower in sodium than most). I will definitely be using this whenever a powdered broth is not necessary! Enjoy the weekend, wherever you are! 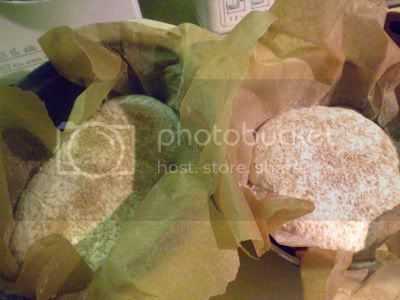 EASTER DINNER PICS, AND MORE PICS OF THE NO-KNEAD BREAD! 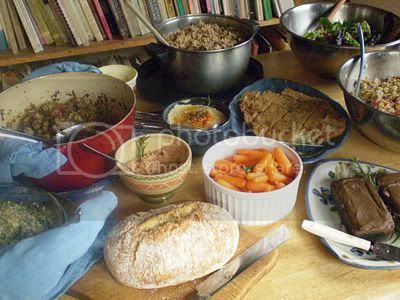 Our casual Easter buffet: In the very front is the Potato Kibbeh; and just above that, in the red pot, is Spicy Middle Eastern Pasta and Chickpea Casserole; to the left of those is a loaf of my No-Knead Bread; and to the right, my Hot Spinach Artichoke Dip (it's the first recipe in the collection posted here). Moving along the table: A loaf of fresh bread in front; with a bowl of Sundried Tomato-Rosemary Spread (this was an experiment-- just Tofu Mayonnaise blended with marinated sundried tomato pieces, garlic, and rosemary-- very good! ); a bowl of Hummous with baby carrots; and a pot of Hashwee (Lebanese Rice) in the back. 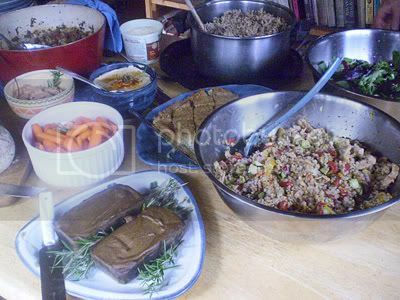 And lastly, my Herbed Veggie Pâté (from my book "The Fiber for Life Cookbook") (there is a slightly more complicated and sophisticated Pâté recipe in my latest book "World Vegan Feast"); and to the right of that, Orange Bulgur Luncheon Salad; and a green salad of baby organic greens, kiwis and strawberries. My daughter Bethany brought the family's traditional Italian Easter bread wreath, and decadent Jamaican Coffee Brownies with Pecans (not vegan, but you could veganize it! ), and Fiona brought a delicious syrup-laced lemon cake for our dessert. We had our family Easter gathering on Saturday. There were 17 of us-- I was the oldest (!!) and my granddaughter Cleo, age 6, was the youngest present. Three of my granddaughters were with their respective other parents, so not able to attend, and my youngest daughter and her partner and son were unable to come from Vancouver. But the rest were all there, including my foster son, Daiv and his partner Fiona, who drove up from Victoria for the day. In my family, only my granddaughter Savannah is a vegetarian (my sister is a vegan, and her daughter is a vegetarian, but they were not at this event), so we tend to keep family get-together meals casual. Everything is vegetarian or vegan, but I don't do a lot of meat subs and that sort of thing. I save that for vegan gatherings. Everyone stuffed themselves, in any event, and, surprisingly, the younger kids loved the pâté and ate it in chunks, just by itself! We had a great time-- noisy, as usual! I hope you did, too! BTW, I made 3 loaves of the new No-Knead Bread from this post, plus a focaccia (which disappeared in 2 minutes flat!) and it came out spectacularly! 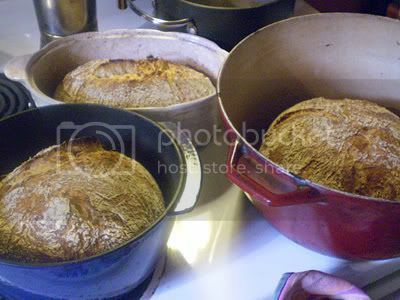 I used 3 different types of pans for the loaves, as the picture below will show. We only had about 1/3 of a loaf left over after the meal. I used a 4-day old dough and the bread had so much flavor! The bread stays moist for several days inside, I'm happy to say! 5-MINUTE NO-KNEAD YEAST BREAD (AND FOCACCIA), TAKE TWO! Okay, I promise not to do another bread blog post for a while! But I just had to post this one! ANOTHER UPDATE AT BOTTOM OF POST--FLATBREADS! AND MORE PICTURES HERE. I doubled the recipe because I thought the loaf size of the original recipe was too small. The original recipe called for all unbleached flour-I used more than 1/3 whole wheat. It also called for 1 1/2 tablespoons of yeast for a recipe half this size, which I think is way too much. (I can't figure out why they used so much yeast. ) I cut that by 2/3's. I also added 1/2 tablespoon olive oil per loaf because I thought the dough was a little tough without it, especially for pizza. I combined some of the quality's of Jim Lahey's no-knead bread, along with his novel baking method, with the Jeff Hertzberg's "five-minute" no-knead, refrigerated dough method. MORE PICTURES OF THIS BREAD ON THIS BLOG POST! AND 5.) the wet dough is much easier to handle when cold. I used a little more water than required by the "five-minute" recipe, so that the dough was more like Lahey's very wet dough. 6.) The wetter dough tends to give you more big irregular holes. 7.) 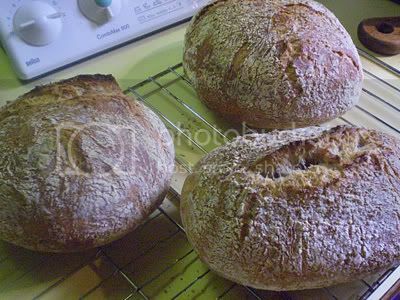 The bread baked by Lahey's method stayed crunchy after it cooled, and I have found that often you'll get a crispy crust in your home oven, after using steam, etc., but then it softens as it cools. Not this way! The baking in a heavy, covered pot acts like a miniature brick oven, creating steam inside to help the crust get crispy and stay that way! 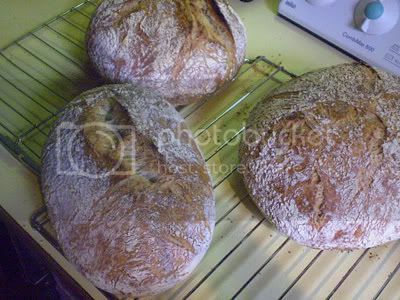 The finalized recipe for this bread will be in a new book coming out late in 2010. "It makes sense. The long, slow rise does over hours what intensive kneading does in minutes: it brings the gluten molecules into side-by-side alignment to maximize their opportunity to bind to each other and produce a strong, elastic network. The wetness of the dough is an important piece of this because the gluten molecules are more mobile in a high proportion of water, and so can move into alignment easier and faster than if the dough were stiff." 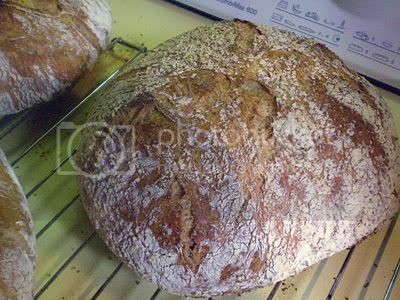 As well, the long rise produces umami flavor compounds which give the bread outstanding flavor. UPDATE: I made some flatbreads with the (cold) dough this morning-- just took fist-sized pieces and rolled them out and cooked them on both sides in an ungreased cast-iron pan over medium heat (heat pan well first). They probably would have made "pockets" if I'd covered them and let them rise for 30 minutes or so, but they did bubble up and they are delicious! 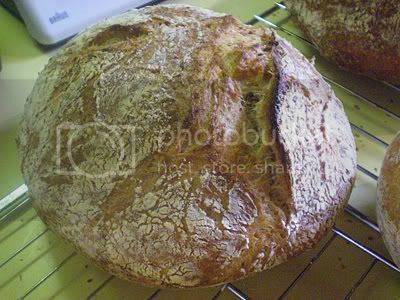 ANOTHER KIND OF NO-KNEAD BREAD-- I LIKE THIS ONE! You may have read about my experiment with the other no-knead sensation from Jim Lahey via Mark Bittman at the new York Times. That was a great bread, but it did require some planning ahead. The "five-minute" bread is similar in some ways-- a very simple dough, very wet, no kneading, long rise. The long rise is what gives it exceptional flavor and gives strength to the gluten the way kneading ordinarily would. The author is a professional baker who operated an Italian bread business. Her breads often (but not always) use a starter or biga (firm Italian starter), she stirs the dough with a wooden spoon for about 2 minutes, and then, with many of the recipes, you have the option of using it after a 40-minute rise, OR an overnight rise in the refrigerator. The ones I tried came out pretty well, but I definitely think the longer rise improved flavor. I compared Jim Lahey's recipe with the "five-minute" one, and a basic one from "No Need to Knead". 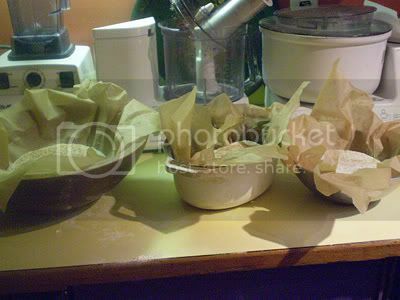 The amount of water to flour is about the same (Jim Lahey's used a tiny bit more water-- for a recipe the size of the recipe below, you would add about 1/4 cup more water). The amount of yeast really varies, though. The Jim Lahey dough has an 18 hour rise at room temperature, so you start with only 1/4 teaspoon instant yeast (1/3 teaspoon regular dry active yeast). Dunaway uses 2 teaspoons yeast for a dough about 2/3 the weight of the one below. The "five-minute" dough calls for 1 1/2 TABLESPOONS of yeast-- I find that excessive. I really can't figure out why they would use so much yeast. I used 1/3 as much (1/2 tablespoon) and it rose beautifully, as you can see from the pictures below! NOTE: I had no suitable container empty, so I used the plastic box that organic baby salad greens come in! The dough just after mixing. The dough after being in the refrigerator for 24 hours. I made some of the "five-minute" dough yesterday, using less yeast and some whole wheat flour, and baked a loaf of bread today (I plan to make pizza with the rest of the dough tonight-- I'll report on that!) I thought 1/4 of the dough looked too small, so I used half the dough for a round loaf. b) handling the dough with alot of care after retarding, no punchdown whatsoever! all the things in combination work, none of them alone !!" The crust was better on Jim Lahey's bread, but the taste of this one was better, we thought. I might try the "five-minute" bread in a cast iron Dutch oven. I'm sure that many recipes are adaptable to this very easy method! The original recipe called for all unbleached flour— I used some whole wheat. 2. Bake at this point or refrigerate, covered, for as long as two weeks. When ready to bake, sprinkle a little flour on dough and cut off a grapefruit-size piece with dough cutter/bench scraper (metal or plastic). Turn dough in hands to lightly stretch surface, creating a rounded top and a lumpy bottom. Put dough on pizza peel [or a or cookie sheet with no sides-- BCG] sprinkled with cornmeal; let rest 40 minutes. [I let it rise 1 hour- BCG] Repeat with remaining dough or refrigerate it. 3. Place broiler pan in bottom of oven. Place baking stone or large cast iron skillet, cast iron pizza pan or cast iron griddle on middle rack of oven and turn oven to 450 degrees F [I used convection, too-- BCG]; heat stone at that temperature for at least 45 minutes (cast iron pans only require 30 minutes). 4. 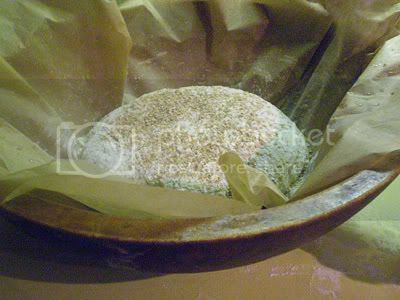 Dust dough with flour, slash top with serrated or very sharp knife three-four times. Slide onto stone. Pour one cup hot water into broiler pan and shut oven quickly to trap steam. [NOTE: I used my little Cuisinart countertop BrickOven and you don’t need steam in that—it worked great! BCG] Bake until well browned, about 30 minutes. Cool completely. Variation: If not using stone or cast iron pan, stretch rounded dough into oval and place in a greased, nonstick loaf pan. Let rest 40 minutes if fresh, an extra hour if refrigerated. Heat oven to 450 degrees for 5 minutes. Place pan on middle rack. I made two 12" pizzas, but I think 3 would have been better. Even though the dough was cold and I got it right into the oven after rolling, it rose like crazy! This crust was a little tough, but I think that is because it rose so much and had to cook longer because of the thickness. Adding a little olive oil to the dough next time might be a good idea for pizza. It was very good, but I will make 3 pizzas (with half of the dough) next time because I like a thin crust. This post is going to be short and sweet. 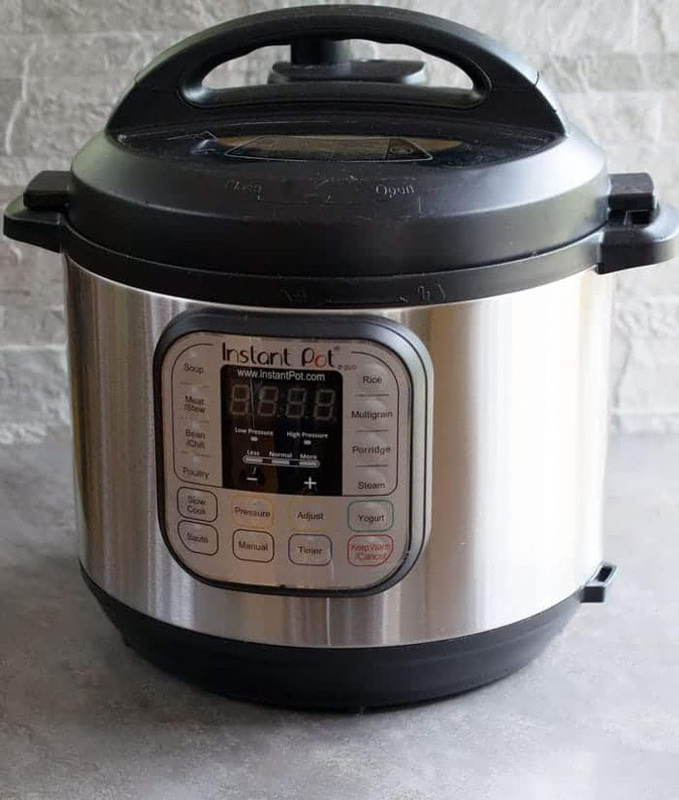 I'm under a deadline and, most of the time, when I'm cooking these days, it's for the Field Roast book I'm finishing, and I can't post those recipes! The other night I had some chickpeas to use up and I decided to try this dish from one of my favorite authors, Habeeb Salloum, a wonderful Canadian writer/cook of Syrian descent. This recipe is from his very readable book "Arab Cooking on a Saskatchewan Homestead: Recipes and Recollections". It was the Silver Winner of the 2006 Canadian Culinary Awards, Canadian Food Culture Category. "Possibly the most uniquely Canadian book I've seen in several years is Habeeb Salloum's Arab Cooking on a Saskatchewan Homestead: Recipes and Recollections from the Canadian Plains Research Centre at the University of Regina. Salloum's parents emigrated to Canada from Syria in the early 1920s, and settled in Saskatchewan. He grew up as a prairie farm kid, joined the RCAF for World War II, then worked for the federal government for thirty-six years before retiring to a third career as a freelance historian, writer, and, on the evidence presented in the book, a food lover. As cookbooks go, this is the real deal for people who like Middle Eastern cuisine, but it is a lot more than merely a cookbook. It is also a fine piece of cultural history written by a man about equally rooted in Arab and Canadian culture, in agricultural and nutritional science, and, most firmly, in Saskatchewan's history of rural immigration. It is therefore a useful book on several grounds." There's another great description and review here. Here's a passage from that review: "'With their food, Syrian immigrants were 100 years ahead of their time,' he says. He sent in the unsolicited cookbook manuscript to the University of Regina's Canadian Plains Research Center and crossed his fingers. 'If it had been a straight-up cookbook we wouldn't have published it. It's the recollection part that interested us," says publication coordinator Brian Mlazgar. 'I've been publishing books in Saskatchewan for 30 years and I had no idea there were Syrian-Lebanese people here that early.'" I love checking out the recipes for lentils, chickpeas, bulgur and other simple foods that were staples for this family during the Great Depression, cooked with Middle Eastern panache of his mother. This recipe is a keeper! It's simple but very yummy, and naturally vegan. Like many Middle Eastern pasta dishes, this recipe utilizes an unusual cooking method-- you just chuck the raw pasta into the dish with some extra liquid. It really works! From "Arab Cooking on a Saskatchewan Homestead: Recipes and Recollections" by Habeeb Salloum. Heat the oil in a large skillet and saute the onions and garlic in it over medium heat until they begin to brown. Stir in the cilantro and hot pepper and saute a few minutes more. Mix in the remaining ingredients, mix well, and scoop into a 2 qt. oiled casserole dish. Cover and bake for 1 hour. Nutrition (per serving): 267.7 calories; 21% calories from fat; 6.6g total fat; 0.0mg cholesterol; 512.7mg sodium; 539.5mg potassium; 45.8g carbohydrates; 8.4g fiber; 8.0g sugar; 37.4g net carbs; 10.1g protein; 5.1 points. EAT YOUR HEART OUT, ANTHONY BOURDAIN! A VEGAN "SPLINTER FACTION" PIZZA PARTY! The following passage by bad-boy chef/author Anthony Bourdain inspired my vegan friends Sarah and Gordon to invite a few other vegans over for a vegan "splinter faction" pizza party last Saturday. "Vegetarians, and their Hezbollah-like splinter faction, the vegans, are a persistent irritant to any chef worth a damn. To me, life without veal stock, pork fat, sausage, organ meat, demi-glace, or even stinky cheese is a life not worth living. Vegetarians are the enemy of everything good and decent in the human spirit, and an affront to all I stand for, the pure enjoyment of food. The body, these waterheads imagine, is a temple that should not be polluted by animal protein. It's healthier, they insist, though every vegetarian waiter I've worked with is brought down by any rumor of a cold. Oh, I'll accommodate them, I'll rummage around for something to feed them, for a 'vegetarian plate', if called on to do so. Fourteen dollars for a few slices of grilled eggplant and zucchini suits my food cost fine." From Kitchen Confidential, by Anthony Bourdain, p. 70. "This passage tells us a lot about Bourdain and almost nothing about vegetarianism. To write that 'vegetarians are the enemy of everything good and decent in the human spirit' is quite a sweeping statement. When I think of, for instance, well-known living vegetarians, the type of persons who come to mind are people like Jane Goodall and Paul McCartney, who are first-class humanitarians. As for vegetarianism being 'an affront' to 'the pure enjoyment of food,' Bourdain clearly never had the pleasure of dining at, say, the Angelica Kitchen in New York City. And his characterization of vegetarians as being solely health conscious— 'the body, these waterheads imagine, is a temple that should not be polluted by animal protein'”—conveniently ignores the fact that many persons who are vegetarians are so for environmental and ethical reasons. As for the vegetarian waiters who are allegedly 'brought down by even the rumor of a cold,' well, if there’s a literary society somewhere that hands out awards for the most ridiculous writing, I hope it bestows an award upon Bourdain. He clearly deserves it." And, might I add, Mr. Bourdain reveals not only his ignorance, but his lack of imagination as a chef! Well, we all thought it was a great excuse for a party, and everyone brought their own dough, sauces and toppings (and I brought my new Cuisinart Brickoven for an extra oven). One of our party had never made a yeast dough before, AND she tried a kamut flour dough! She was really nervous about it, but it was just great! Suzanne stressing over her kamut pizza dough, which was a big hit! Gordon made a thin crust pizza with caramelized onions, slices of fresh pear, and cracked pepper-- to die for! I made my Neapolitan pizza dough (UPDATE: recipe in my book World Vegan Feast) and my usual simple pizza sauce, and brought sliced marinated artichoke hearts, kalamata olives, roasted onions and portobello mushrooms, and roasted zucchini, eggplant, red pepper, and garlic, along with Sheese mozzarella, as toppings. But, you know, the cheese-less pizzas were all very delicious! I was acting as sort of "pizza coordinator" with our hostess Sarah, so I didn't take any pictures. My husband did, but he always takes photos of people, not food! I forgot to remind him! So the pizza pics here are from former pizza feasts, but they are my pizzas! Other topping combinations included: arugula with fresh tomatoes and lots of garlic; and spinach with pine nuts and homemade vegan "feta". There were others, but I can't even remember now! We shamelessly stuffed ourselves! We also had a lovely organic green salad, and some delicious appetizers, such as marinated cucumber spears, dried figs eaten with a beet relish (sounds weird, but it was divine! ), nuts and other dried fruits. For dessert Sarah made a delectable Tofutti cheesecake, served with a strawberry coulis and lemon sorbet. BTW, my little Cuisinart Brickoven performed really well-- better than the big oven! The pizzas baked in it (directly on the stone, at 500 degrees F) cooked quickly, and the edge of the crust blistered like a real stone oven pizza! Here are a few more pictures of the fun. And, BTW, the floured overturned bowls on the counter were there in case anyone wanted to try stretching the partly-rolled out dough over them for a thin-crust pizza-- this is an easy alternative to spinning a pizza or stretching it on your knuckles. 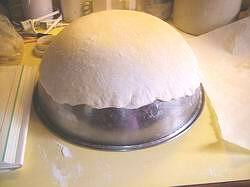 You drape the dough over an over-turned bowl (see picture below) and gently stretch it until it is the right size, using the weight of the dough stretch it. Work slowly so that you don’t tear the dough. If it does tear, by some chance, you can patch it and seal it again. The pizza does not have to be absolutely round! You can use a rolling pin only, but Neapolitans are of the opinion that this makes a flatter and less chewy crust. Prepping with Sarah in her new kitchen. Fireweed taking a turn at rolling her dough. Happy rolling, topping and baking!